I hung the ironing board part on the wall and placed folding brackets underneath so that it would hang down when not in use and could be lifted up when we wanted to use it. Underneath our laundry hamper, where I built the storage cabinet, I added spring rods and hung the three baskets that also came with our old Target laundry hamper. I want to still make labels for them such as "Delicates", "Whites/Bleach" and "Ironing". The bins are hanging behind the green curtain. 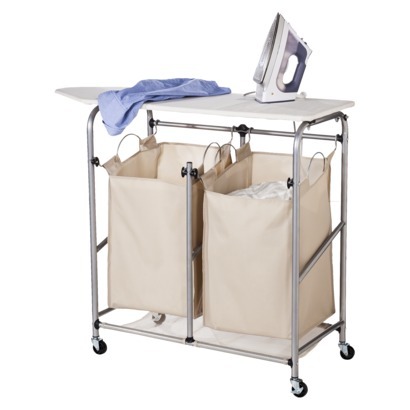 Our new fold-away ironing board and hanging storage bins!